February 16, 2017 | By Cape Publishing | Filed in: Inside Scoop. 2016 was full of so many wonderful moments, horse show adventures, hacks in the field, a fun clinic, successful Love of Linda Benefit, and many days spent with our wonderful horses and ponies, and great, and sometimes wild, friends (you know who you are). There has been lots of excitement, success, early mornings and laughter! As we look to a new year, there are some new and exciting partnerships, and established partners looking to achieve new goals. The winter schooling shows are underway at the farm and have given us a great reason to get together, have lunch, and stay sharp for the upcoming show season. We have participated at the McDonough Horse Shows with the division ponies and look to continue there and Old Salem. We just went to the ECSJ Banquet where we danced, hula-hooped, and earned wonderful awards. Congratulations to all of our ribbon winners in all the various divisions. Way to go; Evelyn, Courntey, Jax, Alex, Jeanne, Corrie, Victoria, Caitlyn, Christina, Kelsey, Emma C., Faith, Kathleen, Tabitha, Robbie, Emma H., Issy, Grace, Allie, Ellie, Jada, and Olivia. Starting off from Spring 2016. 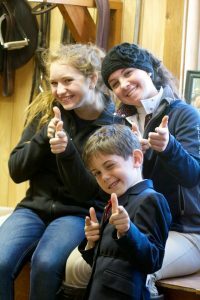 We started the ECSJ show season off with shows held at the farm in March and then headed on the road to Four Seasons at the NJ Horse Park; Hits in Culpeper, VA; Garden State at Sussex Co Fairgrounds; St. Christopher’s and Blue Rock both held at Swan Lake in Gettysburg, PA.; HITS wk 2 in Saugerties, NY. ; Monmouth County Series; and Middlesex County at the NJ Horse Park.Some of the highlights included: Danielle won Ariat and Tabitha won the medal at Four Seasons; Culpepeer included Emma, Tabitha, Caitie, Faith, Allie, Robbie receiving tri-color ribbons in their division and Tabitha winning the medal; at Garden State Kendall and Caitie were reserve champion in their division; at HITS Emma H won the medal and Faith was reserve champion; Momouth had tri-colors from Christina, Tabitha, Robbie, Kathleen, Emma, and Caitie. At Middlesex, Danielle won the Ariat, Tabitha was 2nd in the Classic, and Emma received the best round of the day award with an 85 riding Gingersnap. Some of the highlights included: Danielle won Ariat and Tabitha won the medal at Four Seasons; Culpepeer included Emma, Tabitha, Caitie, Faith, Allie, Robbie receiving tri-color ribbons in their division and Tabitha winning the medal; at Garden State Kendall and Caitie were reserve champion in their division; at HITS Emma H won the medal and Faith was reserve champion; Momouth had tri-colors from Christina, Tabitha, Robbie, Kathleen, Emma, and Caitie. At Middlesex, Danielle won the Ariat, Tabitha was 2nd in the Classic, and Emma received the best round of the day award with an 85 riding Gingersnap. We celebrated that school was out by heading right up to Lake Placid, NY for the Lake Placid Horse Show. 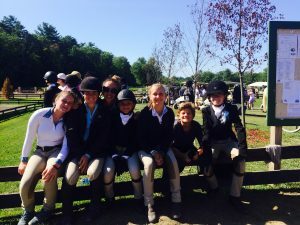 After coming home we headed to the Brandywine Horse Show at the Devon Showgrounds; Star Hollow around the corner, back to Duncraven for their back to back Hunterdon County Shows, followed by weeks 4,5, and6 of HITS in Saugerties, NY. In the beginning of August, we headed to Lexington, KY for the National Pony Finals. Monmouth at the Team in Gladstone at the USET Headquarters was the next stop. The summer ended with the Zone 2 Stirrup Cup Finals held in Harrisburg, PA. In addition to horse showing, we had an awesome clinic with Daniel Stewart, and took a field trip to Market Street to have a lesson with Anne Kursinski. At Lake Placid, Issy, Christina, Kendall, Faith and Emma all earned wonderful ribbons. Kendall was 5th in the Classic on Wilhelm and Emma was champion on Gingersnap. Class winners at Brandywine included Robbie and Emma. Heading to Duncraven, Issy won the hack and Tabitha and Emma earned tri-colors. The next 3 weeks at HITS, our team was rocking with too many ribbons to remember. Kendall won the Classic on Wil twice, Danielle and Allie earned tri-colors, and for the Children’s Hunter Pony Finals; Issy, Victoria, Cait, Tabitha, and Kathleen were amazing all receiving ribbons. Kathleen was champion in small ponies, Tabitha was reserve champion in medium ponies, and Caitlyn was reserve champion in large ponies. It was than off to US Pony Finals where Emma and Gingersnap were 16th over fences and 18th overall. Monmouth at the Team was a wonderful day with such a wonderful opportunity to show at the USET Training Center; Emma H was 2nd in the medal, Tabitha was reserve champion, Caitlyn was 2nd in the THIS medal, and Kendall won the Ariat. The following week we headed to Harrisburg National and Stirrup Cup Finals where Issy and Emma received ribbons and Robbie won the hack at both shows. Fall Finals and Fun got underway so quickly with 14 horses and ponies qualifying and competing at Marshall Sterling Finals in Saugerties, NY. Congratulations to Caitlyn, Faith, Ali, Emma H., Emma C., Kendall, Issy, Danielle, Tabitha, Robbie, Kathleen, Victoria, and Ashley. What a great week with lots of ribbons! We came home and had Star Hollow Horse Show at the farm, went to Capital Challenge in Washington, had a wildly successful Love of Linda Hunter Derby and Horse Show at the farm, packed up and headed to Zone II Hunter Finals in Harrisburg, PA, followed up by Pembrook Farm’s dressage shows, back to Duncraven, Mid-Atlantic Equitation Festival with a very exciting costume class and where Kendall and Wil were on the cover of the program, and wrapping up the year with the last ECSJ show featuring the Boot and Bridle Medal Final held at Pembrook Farm. Some of the fall highlights, included Danielle and Sabo qualifying and competing in the national Ariat Finals at the Capital Challenge Horse Show. She was joined by Kendall with Wil and Emma with Gingersnap, who both earned great ribbons and Emma qualified for the World Champion Children’s Hunter Final. Next we had a record breaking Love of Linda Cancer Benefit here at the farm, earning close to $10,000 for this wonderful charity. We had 101 entries and are so thankful to everyone that competed, helped, donated, and enjoyed that beautiful day. Next it was off to zones and a big congratulations to Kendall with Wilhelm and Emma with Gingersnap who qualified and earned great ribbons. Mid-Atlantic Equitation Festival is always a favorite event of the year with the costume class. Our crew of Caitlyn, Emma C., Danielle, Faith, and Emma H., rocked Annie with great costumes and music! They all received great ribbons throughout the weekend. The year wrapped up with the last ECSJ show where the Boot and Bridle Medal Finals Winner was Faith and Countdown and the Reserve Champion was Kelsey and Good Flight. Our PBF series winners included Evelyn, Ellie, Tabitha, Lily, and Caitlyn. Good Luck to all our riders with their horses and ponies in the upcoming year. The show calendar is shaping up to look super busy and exciting. There are a few more winter schooling shows and the ECSJ shows are right around the corner before we head back on the road. Looking forward to another great year of jumping in the field, clinics, good horsemanship and lots more laughter!